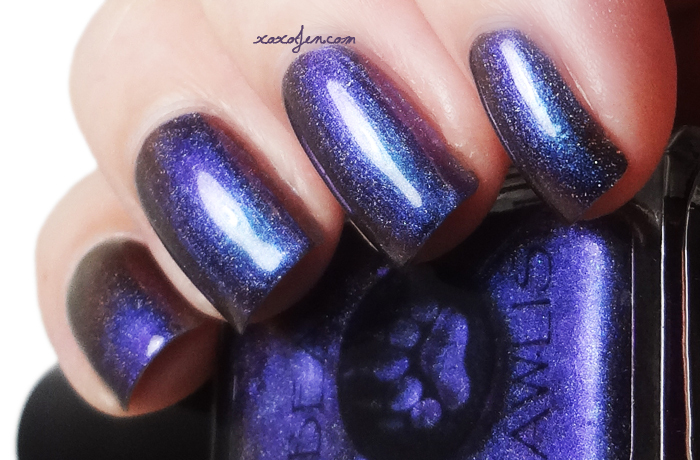 xoxo, Jen: Bear Pawlish: Blast from the past! 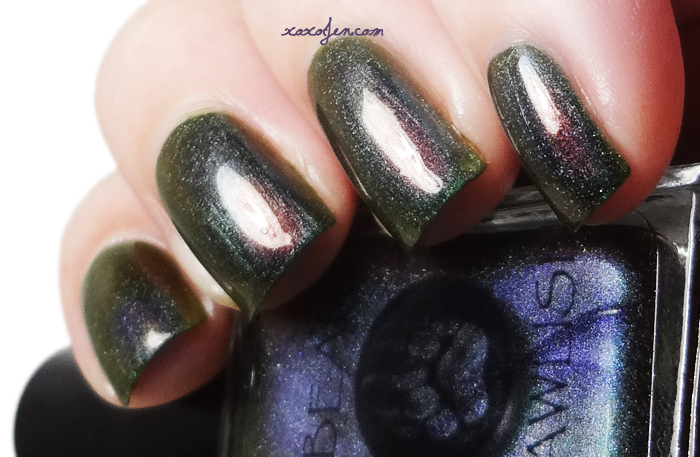 Bear Pawlish: Blast from the past! 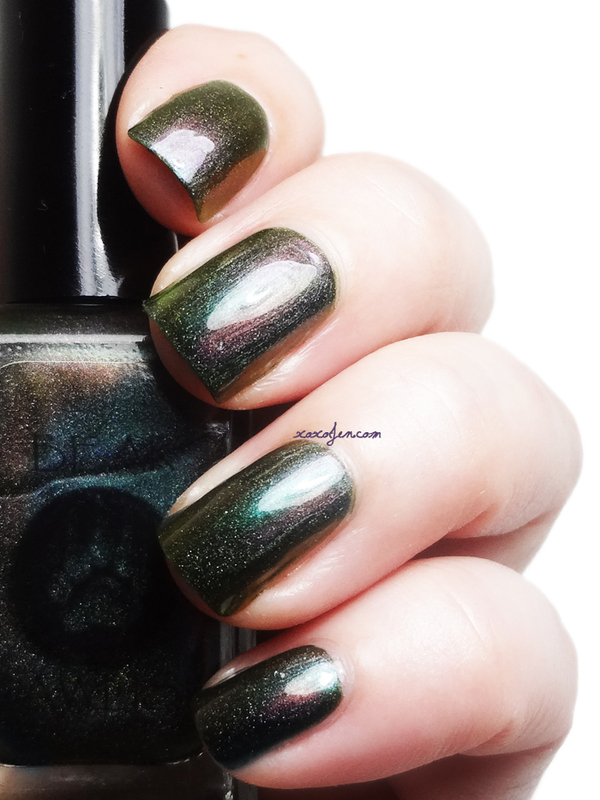 I have a mixture of Bear Pawlish shades to share with you - the first was released in August and the other three polishes were once discontinued but brought back this month from the vault. All four are available in the shop right now! I also have the fall collection that I'm reviewing in a future post, but the bottles are included in the collage below. 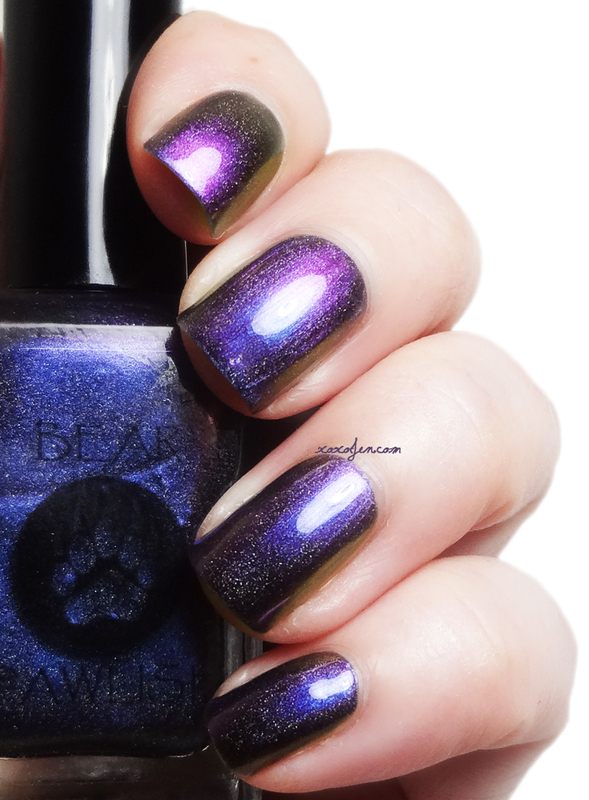 Bigger on the Inside is a dark denim style blue that looks lit from within where the holo flame bursts appear. 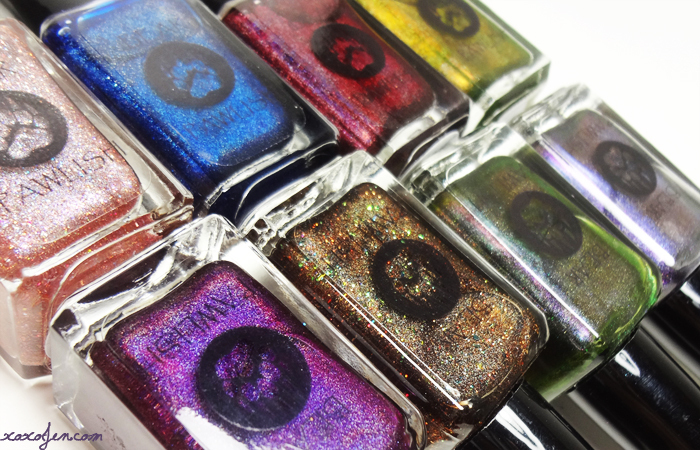 Two easy coats that finish with a glossy shine make this polish outstanding. Untamed is a shifty lil wench! She is so hard to catch in my usual lighting set up. I took a few extra photos to try and catch every shift she has. This polish reminds me of the leaves changing color from green to yellow and red and finally to brown. Two coats with topcoat were worn. As with most shifters/multichromes, the formula was fluid but a little fussy. I found that it is best to get the first coat on in as few brush strokes as possible to avoid drag. This paves the way for the second coat which was very easy to apply. I also like the small flat brushes, they allow for easy control of the polish on the nail with very little clean up. I didn't expect to love this one as much as I do. It totally reminds me of when leaves are turning from green to yellow and orange to kick off the fall season. Two coats with topcoat, the formula for this one seemed less fussy when getting the first coat on with as few brush strokes as possible, the second coat was smooth and easy to apply. Those colors!! I can't even. Purple, blue and everything in between! Gender Bender is a shifter that was very photogenic! Not camera shy at all. I used two coats with topcoat, similar formula to the other two shifters. Find these and many more at the Bear Pawlish online shop and thank you for stopping by!